The CSS Exam includes 4 different types of test. First one is written examination, those who clear this test will be allowed to take other test as medical test, psychological test and viva voice. Eligibility criteria of CSS exam are not too hard. Both male and female are allowed to take test but there are some condition that must be fulfill by the candidates those are interest to apply CSS exam. Not more than two 2nd divisions or D grade is allowed. Candidate must have completed his Bachelor Degree from any HEC recognized university. Those who have Bachelor Degree or equivalent qualification to it, from foreign are also eligible to apply. Generally candidates whose age is less than 30 years are eligible to apply. Test is conducted in all over the Pakistan in not only main cities but in districts as well. But an interview is held only in main cities of Pakistan as Islamabad, KPK , Kaarachi, Lahore and in Quetta. 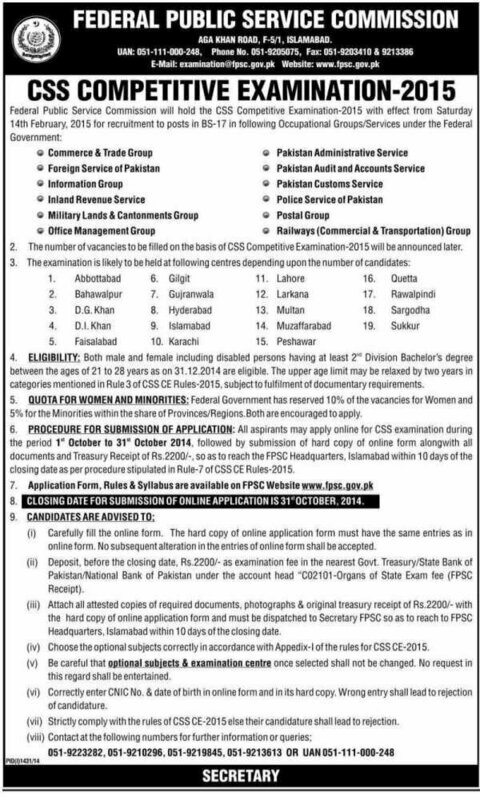 Federal Public Service Commission (FPSC) has announced the test date in newspaper and also procedure of applying. The test of this year will be held on Saturday 14th February, 2015. You must have to visit the official website daily if you are willing to take test in this year. AOA sir, I am from Gilgit Baltistan and a serving govt emp my age 30 years. Having my MA in IR from University of Sarghoda my MA degree will be complete in Aug 2017. After completion of MA I want to apply css exam .Sir basically I want to know the age limit for this exam .any special relaxation for those condidates whose from special area’s I.e Gilgit Baltistan. Please reply ..
plzzzzzzzzz tell me sir may i apply now???????? ?